Samsung’s work on foldable phones to combat the issue of phones becoming larger as display sizes increase. Looking at the ‘double’ screen phone and bendable screen. The foldable mobile phone, where you can open out your smartphone to reveal two screens if you want dual functionality, is a technology Samsung are giving serious design thought and time to. Indeed, a foldable phone is already on the market from ZTE albeit available only in the United States and only on one network. Is it the way ahead or a technological byway? The likely next stage of mobile phone development could be a foldable phone that can provide a large screen area while keeping the physical size of the phone to manageable proportions. The drawback of ever-larger screens is that, despite eking out more screen space by making ultra-thin bezels so the display covers more of the phone’s front, phones inevitably become larger in size. Whilst ‘plus’ size phones such as the Samsung Galaxy S Plus and Apple iPhone Plus are popular with many users, some baulk at owning such a large device and so stick to the smaller versions of each release such as a ‘standard’ iPhone or Galaxy S.
This possible dilemma could become more acute if phones get much bigger in the quest for larger screens, so a foldable phone is the next step to give customers bigger displays yet sensibly sized phones. The technology may not be far away according to some reports, so you may be tempted to sell your phone and ‘go foldable’ before long. The technology that Samsung first showed in prototype form in around 2015 is a smartphone that can be arranged to reveal two full screens by means of a hinge that makes the two screened handset open like a book. The phone has a clamshell design so the two screens show outward at once or the two back panels do during phone ‘downtime’. The screens can be used together as one big display or show two totally different functions on either; for example, one screen could be showing a sat nav map while the other shows the music player or a game. The phone can be used in ‘tent’ mode on a level surface so each screen shows outwards as the phone sits in an inverted ‘V’ style for landscape viewing or held upright for portrait style. Possibly, although rumours do differ; some say a Samsung foldable phone could possibly be the next generation Galaxy S so may be available in spring 2019 – the time of year when the latest Galaxy S range tends to be launched – to possibly not appearing for some years yet. 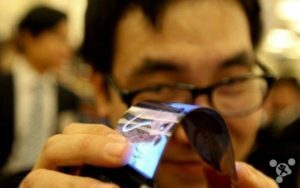 Another technology Samsung is working on is an actual bendable screen that can be unfurled from a relatively compact phone design yet provide the biggest screens yet – over 7 inches according to some predictions. Samsung did show prototypes of the technology back in 2013; a design that featured a very flexible AMOLED screen that could wrap around one’s wrist. 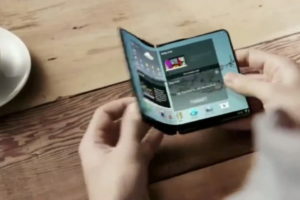 This might be many years away yet but a bendable screen that can unfurl from the phone with a degree of flex might be seen sooner – indeed, some predictions say Samsung could offer this rather than the ‘double’ screen phone as described earlier. As mentioned above the double screen phone is already on the market (in the United States only) courtesy of ZTE with their Axon M. This could act as the guinea pig for future foldable phones.